It’s hard to believe that the John Thomson Exhibition opened two months ago with a buzzy launch party. The time has whizzed by and there’s only 2 and a half weeks left of the exhibition! 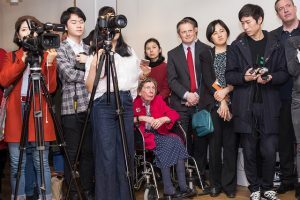 Here is a lively slideshow of the celebrities and other photography lovers who came along to the John Thomson Exhibition launch party. Click through to view each photo. It was great to see so many people at the party snapping selfies of themselves with friends and also taking photos of John Thomson’s images. There was also a corps of press photographers and videographers capturing footage of the event. We were honoured that John Thomson’s great grand daughter and great great grandson were able to attend. We think that Thomson would have loved the tables being turned on him – or perhaps, more accurately, the cameras being turned on him for a change. If he had been around to enjoy the party, he would have been fascinated by the progress that photography has made from the heavy cumbersome wet collodian cameras he had to work with to the amazing little gadgets we can carry in our pockets – and which capture movement, colour and sound, too! We would love you to see this unique exhibition before it ends on 23 June 2018 so please do come along as soon as you can! Details are below.